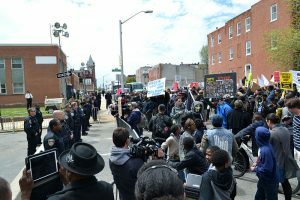 Protest at the Baltimore Police Department Western District building, April 2015. Last week was archives awareness week in Ontario, a week to raise awareness about what archivists do, what archives are, and just generally celebrate all of the good stuff associated with archives. In addition to general archives promotion this week also got me thinking about the connection between archives and activism. The Baltimore Uprising initiative aims to create a digital repository of “content that was captured and created by individual community members, grassroots organizations, and witnesses to the protests that followed the death of Freddie Gray on April 19, 2015.” The project is a collaboration between the Maryland Historical Society, Baltimore university faculty and community organizations. It is a purely digital initiative and is an example of documenting a community member, social protest, and creating archival records through community. Similarly, the Documenting Ferguson project is a digital repository created by Washington University, St. Louis region universities and partners. It aims to preserve and make accessible “community- and media – generated, original content that was captured and created following the killing of 18-year-old Darren Wilson in Ferguson, Missouri on August 9, 2014.” Ferguson and Baltimore are both examples of community driven participatory archiving. Yvonne Ng has argued that “participatory archive movements are especially valuable in communities that institutional archives have traditionally overlooked or misrepresented, and in communities where archives belonging to the state or other institutions have historically enabled discrimination and abuse.” Community archives projects have the potential to create more complete versions of the historical records and create counter narratives to mainstream accounts. The connection of archives and activism isn’t new. Many grassroots community archives have long standing connections to activism and social movements. The archival records held by Union of British Columbia Indian Chiefs (UBCIC) are an example of the documentation of ongoing community based and political activism. UBCIC holds records relating to land claims, Indigenous rights, and decades of resistance to colonialism. Likewise, the Alex Dworkin Canadian Jewish Archives includes a number of collections which document the social and political campaigns of the Canadian Jewish Congress. These are just two of many community based archives across Canada that are strongly rooted in grassroots activism, documenting social inequality, and human rights. Community archives are a crucial window into the histories of communities often not documented by mainstream archives. Occupy Vancouver Signs, 2011. Public Domain Image. However, that is not to say that activism hasn’t also been documented by government or university archives. In Canada there are numerous examples of academic archives working with community groups to document a specific social movement. 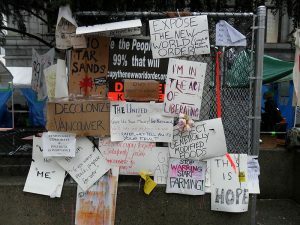 The SFU Special Collections & Rare Books holdings include an Occupy Vancouver Collection which documents the Occupy Vancouver protest movement from 2011-2012. The occupy movement existed across Canada however in many cases the local initiatives weren’t well documented or archived. This lack of documentation highlights the importance of the SFU collection as a unique record of social history. The collection is a mix of photographs, committee minutes, court case records, and publications surrounding the grassroots occupy movement, which has the potential to be a boon to future historians and community activists. There are also examples of more long standing social movements being documented in Canadian archives. In 1992 the University of Ottawa Archives acquired the Canadian Women’s Movement Collection and the Canadian Women’s Movement Archives fonds. The Women’s Archives document the feminist movement in Canada and include over 100 archival fonds focusing on women’s history from 1960-1990. Similarly, the William Ready Division of Archives and Research Collections at McMaster holds records relating to 1950s and 1960s student movements such as the Combined Universities Campaign for Nuclear Disarmament, its successor the Student Union for Peace Action, and the National Federation of Canadian University Students. Additionally the environmental conservation collections at the Laurier Archives contain examples of the work of environmental activism by individuals such as Louisette Lanteigne. There are definite advantages and disadvantages to community activism collections being located within government or university archival settings. These archives tend to have a higher level of staffing and funding than stand alone community or volunteer based archives. This level of resources can help in terms of having material processed and described. There also tends to be less precarity associated with archives located within academic and government organizations – they are unlikely to be dissolved and in the event that they are closed there are often clear disposition policies in place. On the other hand there are structural systems in place at many academic archives that result in limiting collection access to scholars and create barriers for community based individuals and marginalized community members wishing to access records. In 2016 archivist Jarrett M. Drake discussed the patriarchy that our access systems and reading room policies reinforce. He noted “At many of our reading rooms, users of archives are often required to show photo identification, an act for which we have the data proving that ID requirements disparately impact communities of color, the elderly, the poor, and the rural”. Others such as Crystal Fraser and Zoe Todd have written on the complicated relationship that Indigenous people have with mainstream archives and argued that “the structure and function of archives remain bound to National imaginaries and histories.” The structure and policies of some archives can result in the creation of unwelcoming spaces for marginalized communities and place barriers on access. This becomes a larger problem when records documenting a marginalized community or a social activism group are held in a mainstream archive that isn’t accessible to the community it represents. There are ways barriers can be broken down and marginalized communities can be actively invited to participate in the archival process. Some archives are doing that important outreach work. In other cases there is still a lot more work to be done. Personally, I would also like to see more interest in documenting on-going community activism in Canada. As I was writing this post I kept asking myself where are the archives of things like: queer* student organizations on university campuses, the Idle No More movement, the Black Lives Matter Toronto campaign, and the grassroots activism related to Missing and Murdered Indigenous Women, Girls, and 2Spirts? Present day activism includes online communities, on the ground grassroots protests, and ephemeral material. Archivists need to consider how we can better document and support the preservation of this type of evolving community history. Many thanks to Katrina Ackerman, Melissa Adams, Nicolina Baccari, Rebecca Dowson, Andrea Eidinger, Julia Hendry, Shannon Stettner, David Webster and others who contributed suggestions on twitter of archives documenting activism in Canada. Many of their excellent suggestions are worthy of more in-depth exploration. If you know of any organizations that are actively collecting material related to any of these or other grassroots activism movements please share them in the comments. I would be really interested in hearing about them. This is a really important post about the importance of archival resources and that history is always relevant if seen as a resource for the buildng a better future. Thanks David! And good point -the CLGA archives are definitely a great example of a community archives with strong activism holdings. Do you know about the work May Chazan is doing at Trent University. I think she has one project related to archives and women’s movement activism that she’s slowly getting off the ground with a colleague. There are also some groups doing interesting labour history/archival work worth checking out – such as the BC Labour Heritage Centre in Vancouver and the Workers’ Art and Heritage Centre in Hamilton. Thank you both Jo and Alison for your suggestions – it’s great to hear of this working happening elsewhere.